4/7 Cup of Coffee: The 2017 minor league campaign kicked off with a walk-off win, a heartbreaking loss, and a pair of rainouts. Highly touted right-handers Travis Lakins (pictured) and Shaun Anderson were solid on the mound following difficult 2016 seasons. Greenville prevailed in a walk-off victory, while Salem dropped a game it led 6-0 entering the eighth inning. With most of the Northeast getting drenched, Pawtucket and Portland will wait another day to kick off their seasons. Opening day in Allentown was rained out, so they will try again on Friday at 6:30. The teams will play a doubleheader on Sunday to make up for the rainout. The rain that washed out the PawSox and the major league squad did not spare Portland. Hadlock Field will host the 2017 opener at 6:00 on Friday, and Thursday's rainout will be made up on May 5. Salem welcomed the Wood Ducks to the Carolina League by surrendering a late 6-0 lead, giving up a run in the sixth and seven in the ninth. Not lost in the disappoint was an outstanding 2017 debut for Travis Lakins, who struck out nine without issuing a walk in 5 1/3 scoreless innings. The former Ohio State Buckeye fired 61 of 89 pitches for strikes, a strong outing following a 2016 season that saw him slump to a 5.49 ERA. Josh Ockimey delivered Salem's first home run of the season, a fifth-inning three-run shot. Like Lakins, Shaun Anderson was a right-hander who struggled in 2016 but began the new season on a high note. Anderson struck out seven and walked two in 4 2/3 innings, surrendering just one run. Bobby Dalbec picked up where he left off last year, as an extra-base-hitting machine. The third baseman ripped a double in his first plate appearance. With the game knotted at two in the bottom of the ninth, Roldani Baldwin (pictured, right) blasted a walk-off home run to send the Drive home victorious. Player of the Day: Lakins and Anderson both impressed in their openers, but Roldani Baldwin gets the nod for his ninth-inning heroics. The Greenville catcher was 2 for 4 with a dramatic walk-off round-tripper. 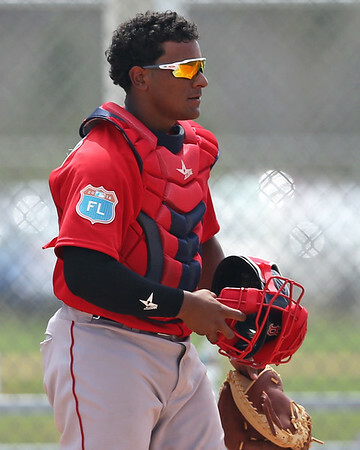 Baldwin struggled at the start of 2016 after an aggressive placement at Greenville, but closed the season strong after getting on track with the Lowell Spinners. 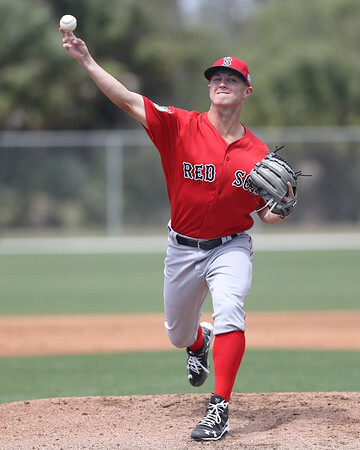 Baldwin is currently ranked the 45th prospect in the system by SoxProspects.com.